The Punjab Tourism Development Corporation has given compulsory retirement to 14 of its employees. Besides one more employee has been given forcible’ retirement under the voluntary retirement scheme taking the total number of employees to be ousted from the organisation to about 40. The Congress was likely to field its own candidate from Garhshankar during the forthcoming Assembly byelections. So far the Congress has been supporting candidates from other political parties. The BJP and the Shiromani Akali Dal will jointly contest the byelection to the two seats of Kapurthala and Garshankar being held next month. Disclosing this here yesterday, the state BJP president, Mr Avinash Rai Khanna said it had already been decided that the BJP would contest the Garshankar seat while the SAD would contest from Kapurthala. Two separate petitions were filed in the Sikh Gurdwara Judicial Commission against certain SGPC members including Mr Baldev Singh here today. The district police has finally registered a case against three boys who allegedly tried to hit their classmate with a sharp-edged weapon, and badly bruised his right hand. Justice Jawahar Lal Gupta, Chief Justice (retd. ), Kerala High Court, highlighted various recommendations of the Malimath Committee report pending consideration in Parliament. 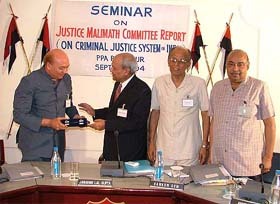 Justice Gupta was speaking at the seminar on " Police criminal justice system…an evaluation of Malimath Committee report" held at the Punjab Police Academy here today. Dr A.A. Siddiqui, DGP, Punjab, presents a memento to Justice Jawahar Lal Gupta at Phillaur Police Academy on Saturday. Decks have finally been cleared with the publication of a notification under Section 6 of the Land Acquisition Act, 1894, for acquiring land to lay 42- km railway line to link Abohar with Fazilka. The bhog of akhand path to atone for the September 8 sacrilege of two birs at the Kotrani dera, near here was held at the local gurdwara Giansar, Satnampura, today. The desecrated birs were later taken to Goindwal Sahib for their ceremonial cremation there. Dr Ramesh Maheshwary, Medical Officer, local Civil Hospital, who is undergoing treatment in the hospital after he was remanded in judicial custody on September 5 said the health authorities should investigate the fact that on whose instigation the complainant, Mr Surinder Kumar, medical representative, Sun Pharmaceutical Industries Limited, had got a false case registered against him. While the ''negative'' vibes of the abrogation of all old agreements on sharing of river waters in July still reverberate, much to the chagrin of Punjab, let us take a look at some quicksilver developments that have escaped public notice, as these were buried in the inside pages of newspapers. Hundreds of acres of green strips along the GT Road the national highway and other roads here has allegedly been usurped by owners of dhabas and restaurants. Owners of marriage palaces, dhabas and restaurants have also started violating Supreme Court directions by displaying lights on trees in green strips belonging to the Punjab Forest Department. The Khalra Mission Committee yesterday gave a clean chit to Didar Singh Dari an alleged activist of the Babbar Khalsa who was arrested in connection with the murder of Baba Jagtar Singh, head granthi of Dera Akal in Tarn Taran. Acting on a complaint, Mr Husan Lal, Deputy Commissioner, Sangrur, has ordered an inquiry into the death of a patient, Pankaj Kumar Sharma (30), a migrant labourer from Begusarai district of Bihar, in the operating theatre of the local Civil Hospital on September 6. The management of Ranjit Sagar Dam, better known as Thein dam, has come under a cloud for releasing excessive water for the Beas-Madhopur link canal in the Upper Bari Doab Canal. Punjab National Bank had a meeting with rice shellers to enlighten them on schemes of the bank here yesterday. As many as 100 rice sheller participated in the function. All branches of the State Bank Of Patiala in the district remained closed due to the strike of the employees. The Bank employees under the banner of All India State Bank Of Patiala Employees Federation organised a demonstration. Poverty stricken farmers of four villages in Ropar district have proved that hard work can change destiny. These landless farmers not only broke the chain of poverty but also helped many others to get employment and become self reliant. The Punjab Agro Foodgrains Corporation, under the chairmanship of Deputy Commissioner Tejveer Singh, organised a meeting to discuss the action plan for contract farming for the rabi season (2004-2005) with focus on hyola here yesterday. The district office of the Punjab Agro Food Grains Corporation in collaboration with the District Agriculture Department yesterday organised a farmers’ camp to impart them training about cultivation of hyola crop at Grain Market, Amloh town, in the district. The Punjab Government has reinstated Mr Harkesh Singh Sidhu, a senior PCS officer, who was suspended in July this year. He has joined duty in the IAS branch here, the state government today said. The Municipal Corporation here launched its website at a function held here today. 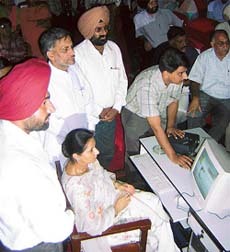 Mrs Preneet Kaur MP in-augurated the website-www.mcpatialaonline.org- at a function held at the MC premises here today. Mayor Vishnu Sharma, Commissioner Manvesh Singh Sidhu, Senior Deputy Mayor Kabir Dass and all Municipal Councillors were present. The district police has registered a case of fraud against nine persons, including three women, who were caught by the Civil Surgeon and the police while running illegal medical camps for administering hepatitis-B injections in two separate raids conducted on July 19. The police registered a case under Section 4 (A) of the Punjab Prohibition of Cow Slaughter Act 1955, against four cattle transporters who were involved in exporting over 600 bullocks out of the state. A 13-year-old boy was abused sexually by a labourer in Kotralehal village under Lehragaga police station under Sangrur district yesterday. Simrat Singh, son of Mr Hardev Singh, a resident of Mustrapur, under the Dhariwal police station, was seriously injured by a sharp-edged weapon. Simrat Singh was reportedly injured in a clash between two students groups. Miscreants stoned the central patwarkhana on the Banga road here around midnight. Its main door and some panes were damaged. Navchetan Singh , an alumnus of Baba Banda Singh Bahadur Engineering College, Fatehgarh Sahib, brought laurels to his college by becoming the only student from the North to be selected for presenting a research paper at International Conference in Washington.